Sports Lifestyle Initiatives offers a variety of programs to cater to children of different ages. For kids 6-24 months old, fun and play methods are utilized to stimulate the baby’s senses. For kids 2-4 years old, the lessons are aimed at building strong foundation of water safety and confidence in the students, upon which they may progress to learn the techniques of the 4 main swimming strokes while for children 4 years old and above, foundational water skill such bubble blowing, floating and stroke techniques of frontcrawl and backstroke introduced. 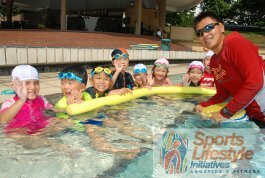 Sports Lifestyle Initiatives Pte ltd, SLI in short, is not your average, run-of-the-mill swimming school. SLI is school whose first priority is your child’s safety. They are also one of the few swimming schools that have a structured program, which is based on the world-renowned Australian method of swimming. Patience and fun are the cornerstones of their methods when it comes to coaching your kids; whereby they intentionally of encouragement and a motivating rewards system to improve and achieve excellent effects for children! Valid only for new customer. Valid for kids : 4-12 years old. Classes are conducted once a week. Valid at Sports Lifestyle Centre, 3500 Bukit Merah Central only. Please call 6100 0754 to register and check availability by 31 December 2011. Indication of start of program must be made in advance. Coupon validity date is non-extendable and coupon is not exchangeable for cash or products. Sports Lifestyle Initiatives Pte Ltd reserves the right to amend the terms & conditions without prior notice.